Ability Score Increase – Your Constitution stat is increased by +2, your Strength stat is increased by +1. Age – Much like their contemporaries, Neanderthals typically live as long as Humans. That said, environment is quite the variable in average age. Alignment – Most Neanderthal don’t think too deeply about morality or ethics, preferring to remain neutral on most issues. Some shade of neutral alignment is the most common. Neutral Good and Neutral Evil are not too uncommon though. 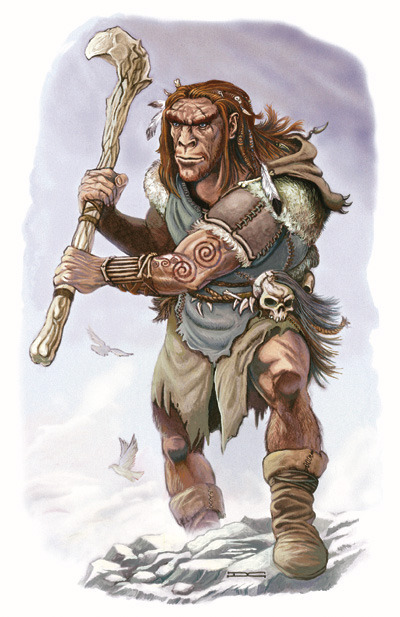 Size – Despite an impressive and somewhat bulky build, Neanderthals are medium sized beings. Primal Weapon Master – You’re used to a life of hunting and gathering. Thus some of your tools equal weapons you’re already trained with. You gain proficiency in the Greatclub, Javelin, Longspear (Pike) and the Blowgun. Observant Survivor – You gain proficiency in the Perception and Survival skills. Rugged Skin – Your skin is tough and almost leather-like from a harsh existence in a cruel natural world. While you are not wearing armor or using a shield, your AC is 12 + Your Constitution modifier. This does not stack with and replaces/can be replaced by related options. Distrust of Magic – Your people have long been superstitious and fearful of magic. As a result, you tend to be unfriendly towards those who use magical tricks. You become proficient in saves against enchantment and illusion based spells. Distrust of Advancement – Crafts of steel defy the natural order you’re accustomed to. While you can adapt to the blade, fully metal armor is a taboo. Wearing armor with metal in it causes personal discomfort, even if you’re proficient. While this provides no mechanical hindrance, getting over this personal issue may take time. Languages – You begin with a basic language of your own people, Neanderthal. You can also write through abstract images detailing your points. You are effectively illiterate without the study of another language.